Calvin was born on November 19, 2007 almost 7 weeks early at the end of a difficult pregnancy. In the NICU, he was put on a ventilator where his lung collapsed, requiring a chest tube. He was born with a VSD hole in his heart and was diagnosed with severe reflux. At three months old he was diagnosed with Infantile Esotropia, was fitted for glasses and had eye surgery at 6 months old. We noticed he was missing his developmental milestones so he started occupational, feeding, vision, and speech therapy. At a year old, Calvin’s health started to fail his body. He was hospitalized at Seattle Children’s with each illness and we began searching for answers. Calvin was diagnosed with severe sleep apnea in November 2009 and had his tonsil/adenoids removed. Waking from surgery proved to be unusually difficult for Calvin, resulting in a nearly three week long hospital stay. He became catatonic and eating/drinking seemed to require too much energy. During his long hospital stay he lost the milestones he had worked so hard to gain and walking and talking went back to crawling and babbling. We were referred to the Developmental Neurology Department where Cal had a head CT, an MRI and numerous blood tests to check for genetic or metabolic disorders. He also had an EEG to test for seizures. His pediatrician told us she suspected Mitochondrial Disease and gave us the name of Dr. Saneto. 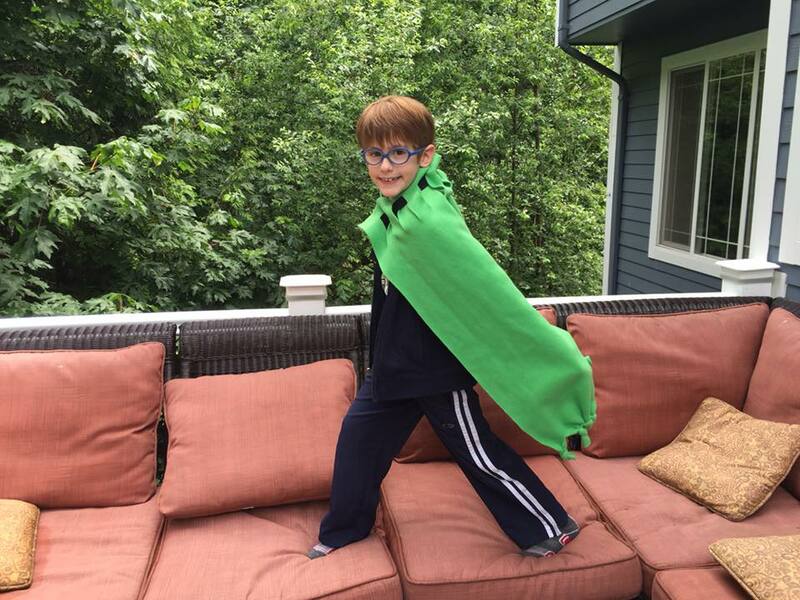 Calvin had a muscle biopsy in May 2010 and was diagnosed with Mito on July 21, 2010. Calvin had a gastric feeding tube surgically placed in his stomach as his weight continued to decrease. His feeding tube continues to provide continuous nutrition overnight and allows us to push countless medications and feeds during the day. Calvin has an ER protocol that requires hospitalization any time he is ill. This year alone he was hospitalized in January, February, March, April, June, July and August. A stomach virus in January and resulted in a 21 day PICU admission. He now has a j-tube and requires feeds up to 22 hours a day with medications that need to be given 24 hours a day. We were told he should never be put under general anesthesia again, but Calvin developed an abscessed infection that required dental surgery in August 2016. But Dr. Phil Morgan was able to develop a plan that used far less medication, and monitoring that allowed our boy to wake up in the PICU the same day as his surgery! Words cannot express the gratitude we have toward Dr. Morgan who not only calmed our fears but those of our little boy who was terrified of another surgery. Keeping Calvin protected is our ultimate goal, but he also has a strong desire to “live life” so as a family we take advantage of the good days by exploring and dream about our next adventure on days we are not well enough to leave the hospital or home. Due to extreme nausea and fatigue, Calvin unfortunately could not return to school this year and missed out on skiing and playing baseball. We have found a small school willing to work with Cal’s unique medical challenges. Our hope is that he will be strong enough to attend again this year. We have come to depend on Children’s for treatment and on the specialists that care for our sweet Calvin and our whole family. As Cal’s mom, I was so inspired by the care Cal has received that I became a Certified Child Life Specialist and have been working at SCH for almost four years. What started as incredible care for our son has expanded far beyond that for our family. The journey has been scary but we have never been alone. We have the support of an entire team at SCH to support us, to give us hope as Cal receives amazing care until a cure can be found.